Papal visits are bigger than Ben Hur. Not least among the challenges they pose is how to satisfy the demands of the mass media for information and opinions. The quality of the response shapes the way the event is seen. The visit of Pope Benedict XVI to Great Britain last year prompted an interesting experiment. The Catholic Church asked for lay volunteers to deal with media enquiries and to appear on panels. The volunteers were trained by a panel who prepared them for the questions they would be likely to receive and commended a style of communicating. 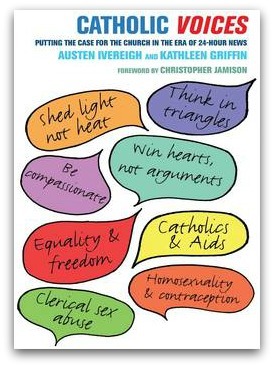 Austen Ivereigh and Kathleen Griffin, journalists who coordinated the scheme, have now given an account of it in their book, Catholic Voices: Putting the case for the Church in an era of 24-hour news. They describe the process, outline the way they addressed controversial questions, and offer the guiding philosophy of communication. The book may well be used as a handbook by other churches for their dealings with the media. When I first read of the Catholic Voices project before the Papal visit I had some reservations. It could be construed as an exercise in corporate spin with its primary focus on persuasion and not on truth. The book is reassuring on that point. But its virtues prompt searching questions about the way communication takes place both in churches and in public life. The questions for which the volunteers were prepared include most of the current controversies involving the Catholic Church. Catholic attitudes to the church and politics, homosexuality, contraception, equality, euthanasia, sexual abuse, Catholic schools, abortion, Aids, and relations with Anglicans all receive attention. They are treated briefly in simple language that equipped people for short interviews with journalists without specialist knowledge. The teaching and practice of the Catholic Church are summarised, the reasons for them explained, and the objections against them teased out. The treatment is urbane, respectful of journalists and of the media to which they belong. In each case attention is paid to the positive values that underlie both Catholic teaching and the objections raised by its critics. The eirenical character of the presentation flows from the simple principles of good communication enunciated in the book. They are based on respect due to partners in conversation and on recognition of the positive values that animate them. Respect enables differences to be explored in a way that generates light, not heat, speaks to the heart as well as the mind, is compassionate, and focuses on winning people rather than winning battles. Respect for truth entails respect for those who seek it, despite disagreements with the positions they take. This attractive ideal of communication is a standard against which both the project itself and other styles of communication prevalent in churches and in public life can be measured. It convicts many Catholic blogs of disrespect for their declamatory and unargued style and for their angry and vituperative tone. It also contrasts with the polemical, dismissive tone found in much religious debate. If the rules of the game required that we columnists make an effort to enter the values that inspire those with whom we disagree, most of us would spend some time in the sin bin. Judged against this standard the contributions of politicians and commentators to public conversation in Australia also leave much to be desired. Discussion of public policy by politicians is usually simplistic and largely focuses on the wickedness or idiocy of the opposed party. Much political comment, too, is partisan, strident and lacking both in respect and in intellectual curiosity. It uses words as weapons to destroy people rather than as tools to test perceptions against a fuller account of reality. For churches the project offers a deeper challenge that is masked by its narrow focus. In responding to media enquiries occasioned by the Papal visit it legitimately confined itself to explaining and giving reasons for faith and Catholic practices. But when Christians participate in large and complex discussions about public policy, they face a more complex tension between respect for truth and respect for their interlocutors. Christians believe truth and value are to be found in Christ. That suggests that when questions of truth arise in conversation, the role of Christians is not to learn but to explain, as the volunteers in Catholic Voices did. The values inherent in the project, however, assume Christians do not possess Christ but follow him, and express his truth and values imperfectly in their lives and reflection. In conversation within their churches and society Christians are searchers for a truth they are committed to but do not possess fully. Respect for others involved in the conversation and honesty about their own flawed lives and insights are conditions for truth to appear. Great article, excellent ideas for journalists, and also assessment of the Australian situation. Andrew you give us some hope with your account of this book. It sounds like a useful resource that may help to mend relations between the people and the Catholic hierarchy. I’m glad you mentioned the problem with politicians; they lose credibility with mainstream voters with their childish attitudes and personal attacks upon each other. Perhaps Tony Abbott could read this book and apply its philosophy to the way he argues issues in Parliament. You say the values inherent in this book assume that possession of the Truth (Christ) is impossible for us humans, I think history shows that this also applies to the Pope and his minders. No one corporation can possess the Truth which includes those who govern the Church. History shows how the Church has claimed to possess salvation and used this power to destroy good and faithful people whose personal experience led them to question church dogma. Your statement: “respect for truth entails respect for those who seek it” means being able to listen with the ears of the heart, so that rational judgments can become better informed! Thank you Andrew for this thoughtful article. We can all learn from what you say about communication. This is refreshing - the efforts of the Catholic church to engage its laity in PR with and for the Church. Surely a step in the right direction. I have often thrown up my hands in despair when reading yet another damaging media article which airs the Church in the worst possible light. Will there be such an initiative in Australia? Hope so, and soon! 'It convicts many Catholic blogs of disrespect for their declamatory and unargued style and for their angry and vituperative tone'. A welcome and timely reminder to all of us who post on this site. Thank you Andrew. It is worth noting Father Hamilton that in the final analysis truth takes priority over oleaginous urbanity;the latter is sniffed out by cynics in a nanosecond;the former, much, much longer, thus the need for clarification, exposition and for solid apologetics on faith issues. Oh for the Dr Rumble M.S.C. genre! Such could combine both[urbanity and truth] with utter integrity,devoid of con-artistry 'spin'. Jesus Himself did not always shine in the unction department before pharisees and temple money lenders etc;none of course would credit him for spin when it came to Truth:thus the crucifixion. Just because there is no legal remedy to the denial of natural justice to former bishop Bill Morris, that is no reason for the senior hierarchy not to reflect acutely on their treatment of him. Respectful dialogue with Toowoomba's church leaders would be a good start.